Health care is an art that must acknowledge the whole of the patient’s life. Health care is about people—people who should have the opportunity to live a healthy life. However, many face barriers that keep them from achieving their best health. Patients that may appear non-compliant or difficult are often held back by their own life circumstances, but health care professionals can mitigate some of those effects. It starts with restoring and strengthening empathy, raising awareness of the issues, and thinking creatively to offer new solutions. “The Art of Health Care” is a powerful video that demonstrates social determinants in the clinical setting and provides strategies from Colorado providers to address patient needs. Originally released in the fall of 2013, it has been incorporated into trainings and curricula around the state, country, and even internationally. Although intended for a health care workforce audience, anyone can benefit from viewing the video and engaging in a reflective discussion afterward. 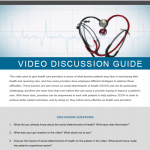 The Art of Health Care video is accompanied by a discussion guide (PDF) for individuals and groups wishing to further explore this issue. We also lead presentations and facilitate structured learning to interested groups and organizations. If you are interested in working with us on a presentation through our speaker’s bureau or utilizing it on your own, please contact our Director of Communications, Sarah McAfee. The Art of Health Care: Social Determinants of Health Video is licensed under a Creative Commons Attribution-NonCommercial 4.0 International License.